Complaints about decline of fisheries, coal dust and killing of turtles around the 630 MW Chinese financed power plant in Pacitan. The two 315 MW units went into commercial operation in 2011. PLN received US$293 million loan from the Export-Import Bank of China to finance the Pacitan plant. The fuel supply for the Pacitan Power Plant comes from the Indonesian islands of Kalimantan and Sumatera. Barges laden with coal pass through the Bali Strait then hug Java’s southern coast, passing through Trenggalek before finally arriving in Pacitan. Data from the Ministry of Energy and Mineral Resources shows that in order to fulfill the Pacitan Power Plant’s need for 2.3 million tons of coal annually, the barges must make at least 20 – 30 trips each month. If they follow the easiest, most direct route, these vessels pass right through sea turtle nesting areas in the southern shores of Pacitan and Trenggalek. |1]. Despite discontent from locals, the plant has always enjoyed government support. It was built in accordance with a 2006 presidential decree that aimed to reduce Indonesia’s dependence on oil, largely by increasing the use of coal for energy generation from 15.7% to more than 33 percent. The plan called for 10,000 megawatts of new power plants to be built by 2009 in the country, among them the 630-megawatt facility at Pacitan. 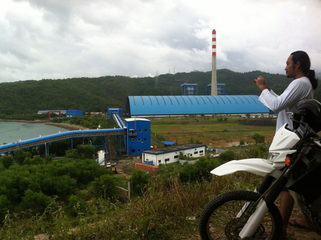 In 2007, the cornerstone for the project was laid by then-Minster of Energy and Mineral Resources Purnomo Yusgiantoro. Operations and maintenance of the Pacitan power plant is managed by PT Jawa Bali Power Plant Business Unit Operations & Maintenance Services, a subsidiary of government-owned electric company PLN. By 2017, coal makes up around 57 percent of the energy mix in Indonesia, the world’s top thermal coal exporter, with consumption expected to reach 101 million tonnes this year. 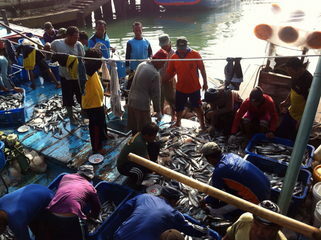 Environmental justice organisations and other supporters Sumberejo Fishermen’s Group. Why? Explain briefly. The coal fired power plant is in operation. Efforts to conserve sea turtles disrupted by coal plant in East Java. 31 January 2017.